Joseph Lister was an English surgeon who introduced the principle of antisepsis, which complemented the theory of Pasteur that bacteria cause infection. Using carbolic acid (phenol) as the antiseptic agent, and employing it alongside the heat sterilization of instruments, Lister brought about a dramatic fall in post-operative fatalities. Although the introduction of anesthetics in the mid-19th century made possible a large number of operations, the survival rate of patients was very low. The reason was not bad surgery, but bacterial infection of the tissues from the instruments and the surroundings. Such infection caused decomposition of the tissues, blood poisoning, and death. Nowadays, every part of the body can be operated upon in safety. The development of the antiseptic method (the forerunner of modern aseptic surgery) was Lister's contribution to medical science. 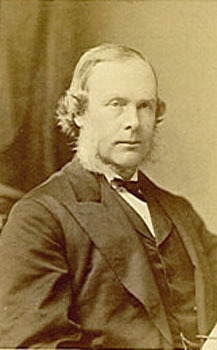 Born near London in 1827, Lister grew up in a scientific atmosphere. His father was a wine merchant but devoted much time to developing microscopic techniques. Young Lister took his degree at London and then studied medicine, qualifying in 1852. During the 1850s he published the results of his work on the muscles of the eye and of the skin. He also studied the role of blood capillaries in inflammation of the tissues, and the mechanisms of blood clotting. This interest in physiology was not an end in itself, however; as his letters clearly show, Lister regarded it as a foundation for the surgical career on which he had set his heart. Lister's first surgical post was as an assistant to Professor James Syme in Edinburgh. Then, after a spell at the Royal Edinburgh Infirmary, he was appointed Professor of Surgery at Glasgow University in 1860. It was here that his most important work was carried out. The hospital wards of which he was in charge had a bad record of gangrene and other similar infections. Lister continued his study of wound healing and inflammation and noted that simple fractures (those where the bone does not break through the skin) healed relatively easily. Compound fractures, where the broken bone is exposed, were often fatal. Many people had thought that the formation of pus, and the putrefaction of the injured tissue, was caused by the air itself, but Lister showed this was not the case. A colleague at Glasgow drew Lister's attention to the work of Pasteur in France. Pasteur had shown that the souring of milk and wine was due to the action of tiny living organisms (bacteria) that were always present in the air. Lister deduced that the putrefaction of wounds was also due to microorganisms and he set about finding a means of destroying them. He suspected that something carried in the air was the cause. Lister chose carbolic acid as his antiseptic and first used it in an operation in 1865. He treated not only the wound (a fractured leg) with carbolic but everything that touched it – hands, instruments, and dressings. He also used a carbolic spray to kill germs in the air. His "antiseptic system" was a success but many people believed that Lister had merely discovered an antiseptic. Lister claimed no such thing – he had not discovered carbolic acid, nor its antiseptic properties. What he had done was to show that wound infection could be cured, and even more important prevented. At the end of the 1860s Lister returned to Edinburgh where he succeeded Syme in the Chair of Clinical Surgery. During this and later periods of his life he continued his researches on antiseptics and improved his methods. Another important introduction of his was the catgut ligature which, unlike previously used materials is absorbed by the body. Lister himself was a very good and careful surgeon, paying close attention to every detail. He developed a number of new techniques and several of his instrument designs are still in use today. During this time, Lister's antiseptic system had gained wide acceptance, except in London, and it was with eagerness that he accepted the Chair of Surgery at King's College in 1877. The success of his methods soon won him support among London medical people and Lister received many honors, becoming a peer in 1897. Lister died in 1912 but his name lives on in the Lister Institute of Preventive Medicine which was renamed after him in 1903.